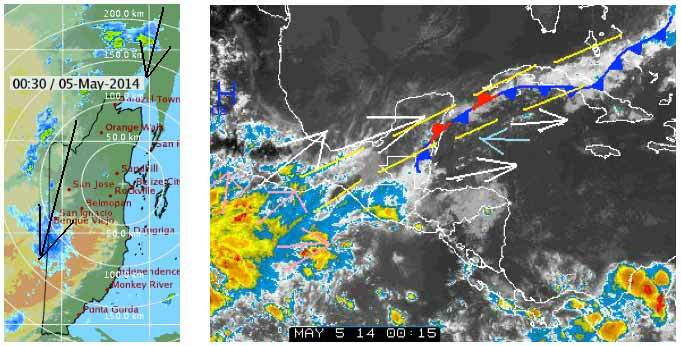 Belize NMS: Frontal boundary across Yucatan maintains moist and unstable conditions over our area. 24-hour forecast: Cloudy skies with a few showers and thunderstorms mainly in the south this morning and inland this afternoon. Cloudy skies tonight with some showers and thunderstorms over most areas but especially in the south. Continuing mostly cloudy tomorrow with a few showers and thunderstorms mainly inland and in the south. Winds: North-northeast 5-15 knots, becoming gusty near the heavier showers and thunderstorms. Marine Outlook: Monday night:- Winds: E-SE 5-15 kts. ; seas: Light chop - choppy. ; waves: 2-4 ft.; isolated showers. General Outlook: For Monday and Monday night is for a gradual improvement in weather conditions. On Ambergris Caye this morning a Northern breeze has put the reef in the lee of the island and calmed the water. We have heavy overcast after a night of rain. Overcast over most of Belize this morning and I expect it to be like this most of the day. The Belize Met Office Radar is stuck yet again. . . . . Still on 3pm yesterday, so no Rain information this morning. But from the Satellite picture, they have now decided to show the remains of the Cool front just past Belize. Which is what I said yesterday . . . Looks as if the US Weather people don't bother to be too accurate with the fronts, when well away from the US. So I will have to try to spot them and mark them with a dashed yellow line. It looks as if the effect of that cool front will be dissipating over the next few hours, but probably a fair amount of cloud behind. That ITCZ activity over the Pacific is streaming cloud out in all directions, but that is vaporising fairly soon. . . . So the whole area looking drier than it has for several days. They have finally got the Radar working again, and very up to date. . .. Rain moving down from the north, most along our Guatamala Border, now well south of Cayo, more approaching the North.. . . . . . .There are two lines of cloud activity sweeping past us right now. That first one bring that rain, the second bringing clearer weather tomorrow.